With sweat dripping down the sides of his reddened cheeks following a workout under the steamy Florida morning sun, Roy Halladay meandered over to a throng of reporters and simply offered a smile. By that point, the circus had already begun with the crowning of the 2011 Phillies rotation - featuring Halladay, Cliff Lee, Cole Hamels, Roy Oswalt, and the overshadowed Joe Blanton - as one of the greatest starting staffs in baseball history. Halladay, 40, died in a plane crash last week in the Gulf of Mexico near his home in Florida. The two-time Cy Young Award winner leaves behind his wife, Brandy, and two sons – Braden and Ryan. Halladay spent only four years in Philadelphia, but his blue-collar mentality and unassuming nature were a match for the city. He was a throwback harmonized with supreme talent. He won a combined 40 games over his first two seasons with the Phillies in 2010 and 2011 while also tossing a perfect game and a postseason no-hitter. His combined 2.40 ERA and 1.04 WHIP over those first two seasons is a testament to his sheer dominance on the mound. Hamels, Lee, Manuel, Chase Utley, and Jimmy Rollins were all in attendance. 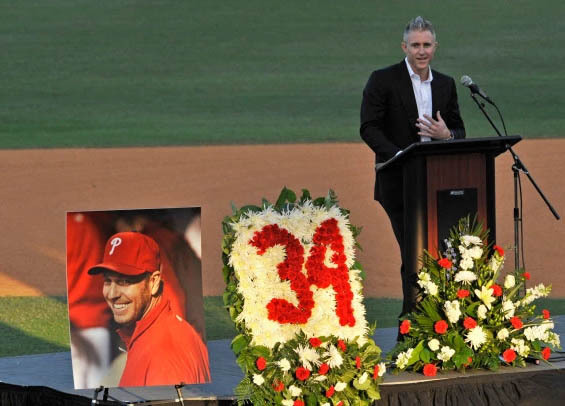 “All eyes are on me,” Halladay's wife said, surrounded by pictures of the pitcher with the Phillies and Blue Jays, along with floral arrangements bearing the 34 and 32 jersey numbers he wore. Halladay was an eight-time All-Star who went 203-105 with a 3.38 ERA in his 16-year career. Prior to coming to Philadelphia, he spent 12 seasons in Toronto. He is eligible for the Hall of Fame in 2019. Arm and shoulder troubles hampered Halladay over his final two seasons in Philadelphia, but he never used pain as an excuse for a poor performance. He lost his pinpoint accuracy and made every attempt to reinvent himself as a pitcher, but his body had worn out. He remained connected with the Phillies, serving this past spring as an instructor to young pitchers while helping them with the mental side of the game. "He certainly would have given more to baseball in the future because of his love for the game," Phillies chairman David Montgomery said. "But his commitment to his family kept him where he was the last few years. We'd had a number of conversations about his potential future in the game. But he just would say, 'I want it, but it's on hold. It's on hold right now because of my family.'" Halladay always had a passion for planes and flying. He earned his pilot's license after retiring from the game and spent nearly 1,000 hours in the air while pursuing a commercial rating. When not in the cockpit he spent time coaching his son's high school and travel baseball teams. "All-Star pitcher. All-Star person. All-Star father and family man," Montgomery said.